I just have to say I have the sweetest man ever. He’s always willing to help in any way possible. And I don’t believe he’s ever said the EN-OH word to me when I needed a hand. Now we all know I’m always up for an amazing roadside redo – so I texted back a big “YES” with about 20 explanation marks! What I didn’t know; M-M-M had to make two trips because he didn’t have enough room in his van. If that’s not sweet enough, he was also running late for a meeting and still took the time to load these babies up! 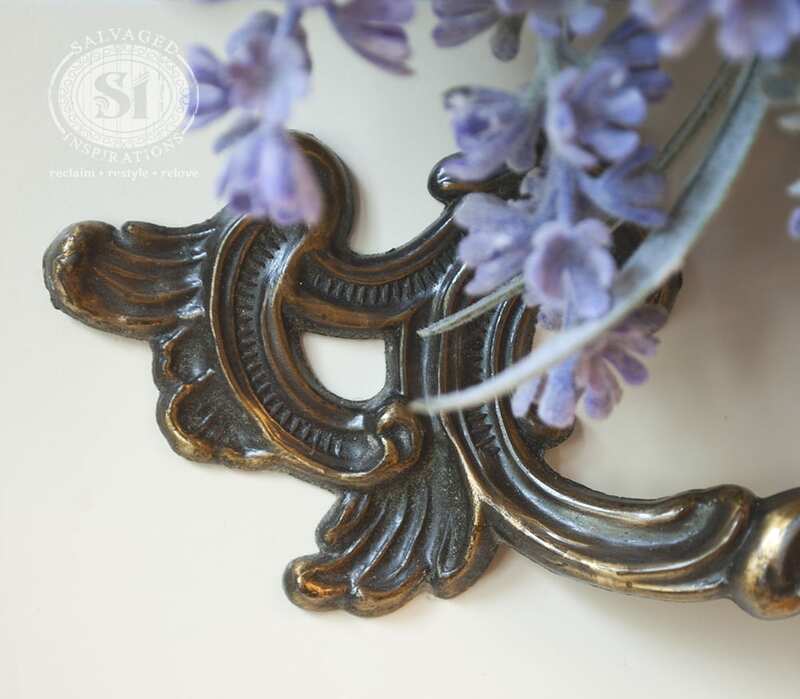 I was thrilled when he brought them home because both pieces have gorgeous lines and are crafted by the reputable Victoriaville in QC. 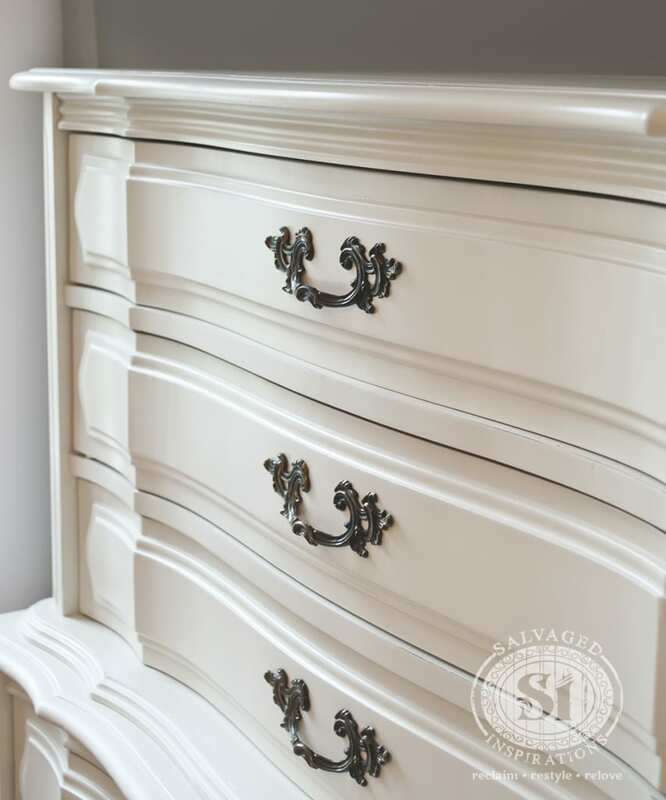 To restyle the tall french provincial, all that was needed was new drawer guides and a few deep scratches filled. No biggie. 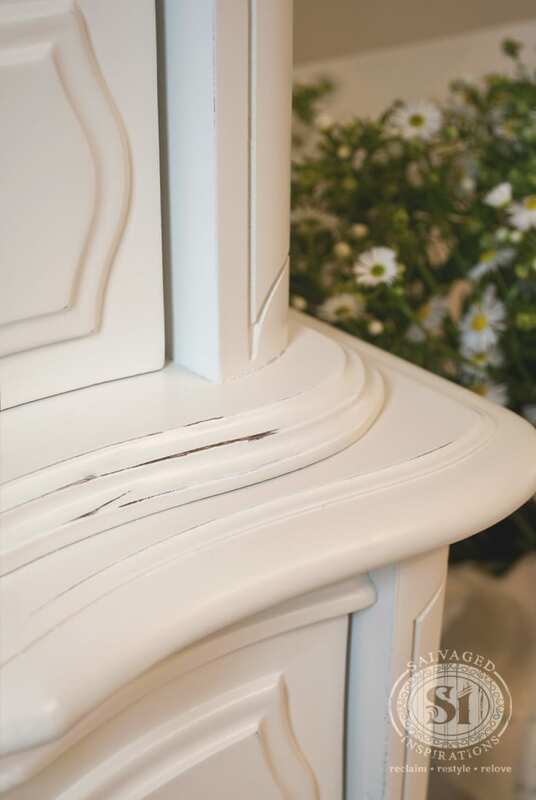 Then this shapely girl was primed and given a flawless spray finish in General Finishes Antique White. 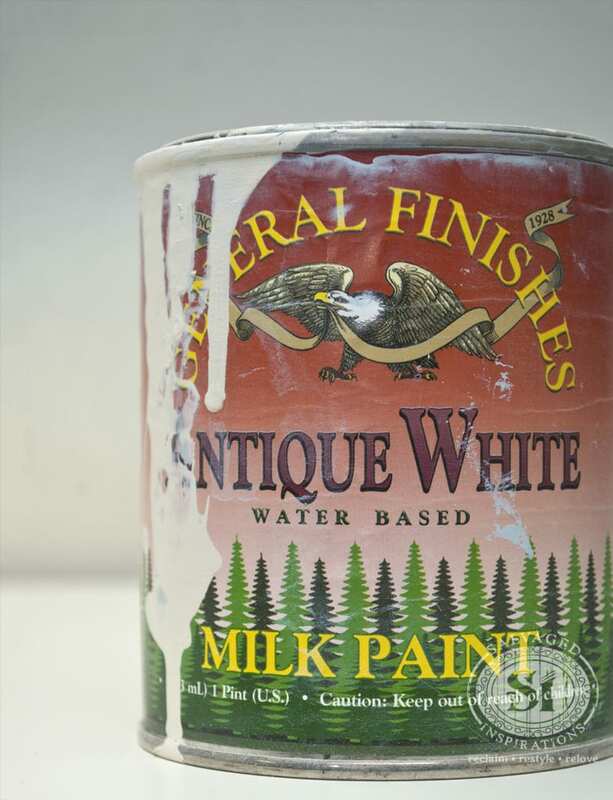 If you’ve ever wondered about or considered spraying with General Finishes Milk Paint – try it! – the results are outstanding! I kept the original hardware and lined the drawers for a clean detailed look. I LOVE trying out different furniture refinishing techniques. Decoupaging, stenciling, and experimenting with color keeps things interesting. But there’s something to be said about a flawless monochromatic finish. 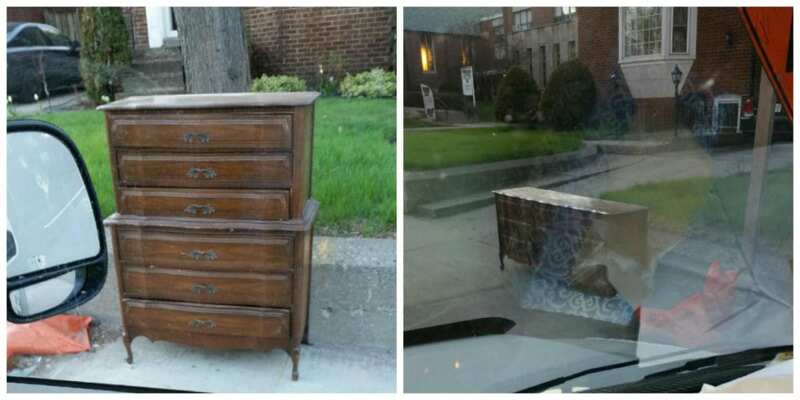 It’s a timeless look and I’m thrilled with the before and after on this salvaged french dresser. She’s classic, elegant and timeless! Feel free to leave a comment and chime in below! I always love hearing from you! Enjoy your day and have fun with your next project! Your work is absolutely gorgeous and I wondered if you sold pieces? 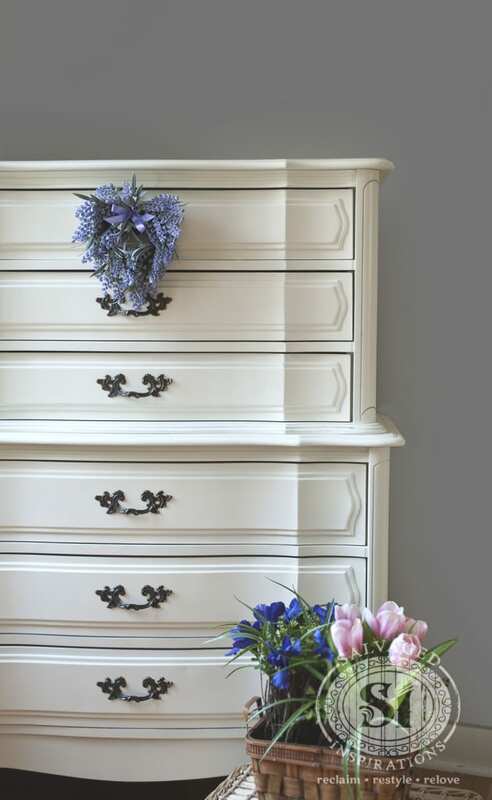 I am looking for a white French Provincial bedroom set. Preferably a tall one like u have shown and a long dresser. Hey there! I was wondering how you lined those drawers!?? They look so perfect and clean!?? I love the perfection of this finish. Very nice. I’m a bit fussy when it comes to finishes. I like the whitewashed look but I want the feel to be flawless. It looks like you well have accomplished this. Beautiful piece. I love it!!!! I’m a roadside collecter to it’s the best!! Where to u find the paper that goes in your drawers? Thanks Jen. 🙂 Hmmm, I’ve used GF Antique White numerous times (and always have it on hand!) because I like the warm undertones. But GF Snow White is equally gorgeous if your looking for a more modern clean white. Having said that, I haven’t purchased any GF Snow White because I have a few gallons of Sherwin Williams #7006 Extra White in my inventory which is almost identical. It has almost a slight bluish undertone which gives it a stark/clean look. Personal preference for sure. Good luck… I’m sure either one you choose will look stunning Jen! Hi Denise, which type of liner did you use for the inside drawers. 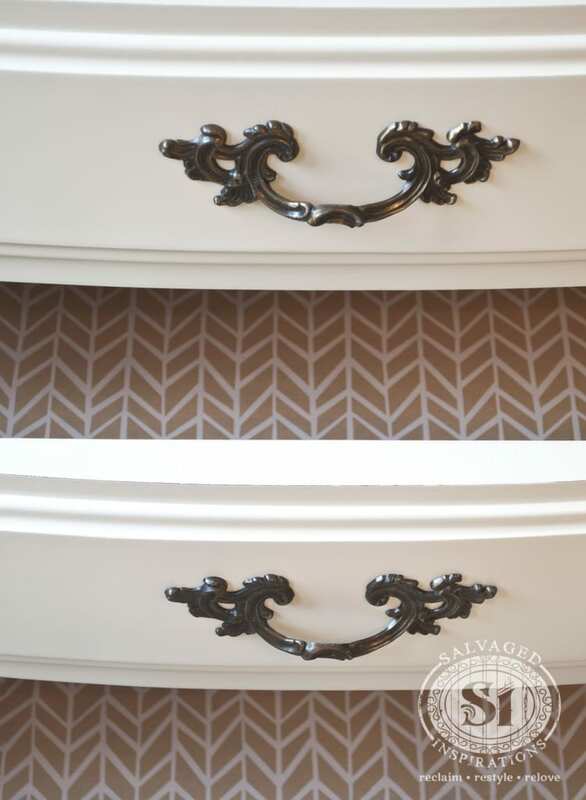 I would like create the same effect for the dresser I bought today. l love the dresser. I have a similar one that I’m wanting to paint for my granddaughter’s bedroom. My question is what kind of clear coat or top coat should I use for a child’s dresser that will receive lots of use ? 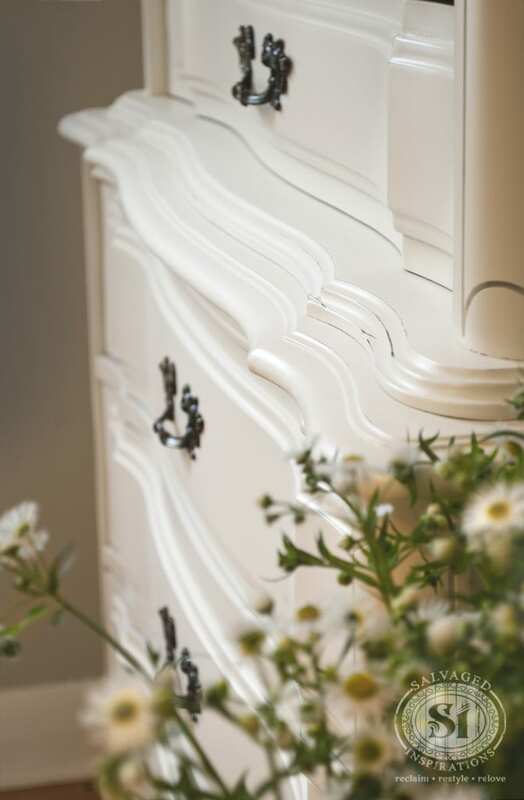 Wax or poly is a good choice for dressers. However the wax often needs to be reapplied down the road. If you think the piece may take a beating (like my friend who has 5 energetic boys! ), then poly may be the better choice. Hi Denise! How are you? Your website came up during a google search of General Finishes Milk Paint. I’m so grateful it did. I’ve recently purchased an antique or vintage (I’m not sure what categorizes what) dresser and want to use General Finishes Milk Paint. I’m between the colors of Linen and Antique white but quite unsure. Is the Antique White creamy/ivory or is it WHITE? 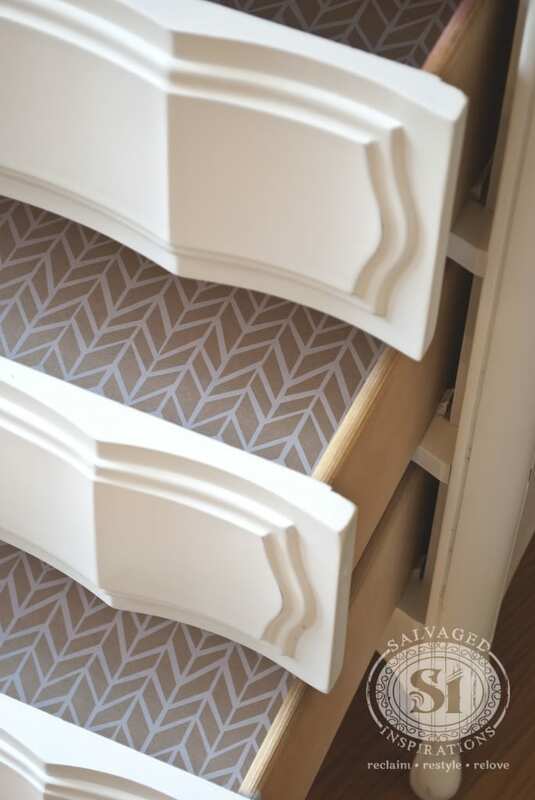 The drawer linings are really nice as well as the fabulous paint job. That was some find on the curb! What did you ise to line the drawers? Thank you Bob! 🙂 To line these drawers I used gift wrap purchased at Michael’s. I think it adds that little extra detail to a solid painted piece. 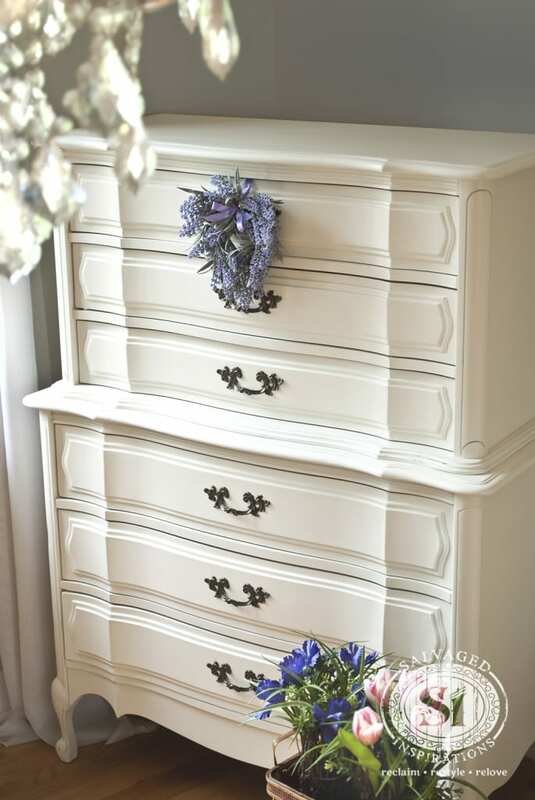 I love painting these French Provincial dressers in white. Great find. Love your weed bouquet!!!! …lol…thank Mary! I don’t know what the heck these weeds were but they did the job. 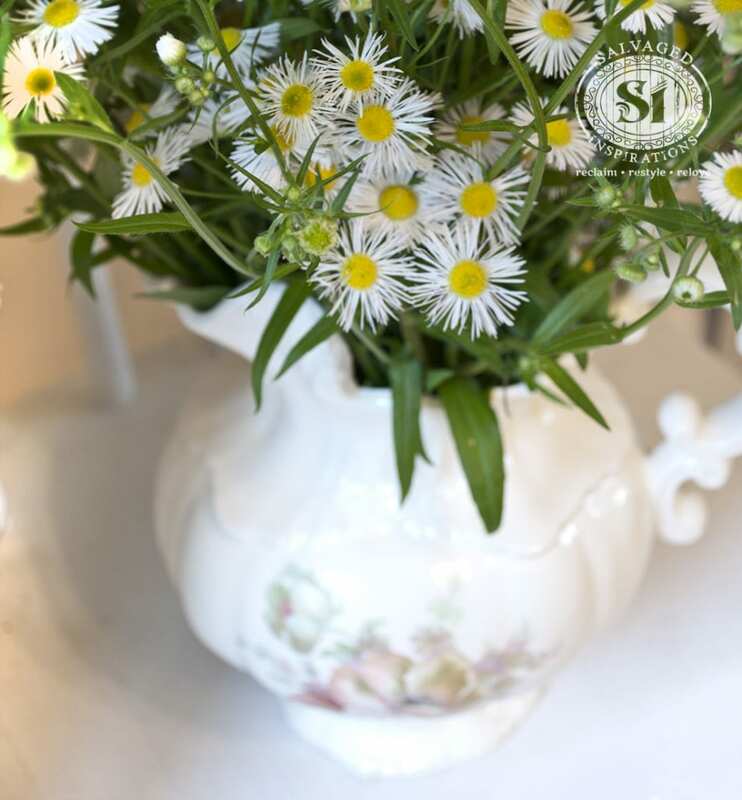 You know what weed(s) I absolutely LOVE to use in bouquets?… (and I’ll stop roadside to pick them) is Queen Anne’s Lace! Colleen, I didn’t have any luck with Wagner either, so I much prefer my Husky Spray Gun. Having said that, it’s kind of an unfair comparison seeing as Wagner’s are not run off a compressor. The Husky is lighter than the Wagner systems (1.345lbs) but there is still some weight to it once I add the paint to my gravity feed cup. Clean up is fairly easy with water based products – not so fun with shellacs/oil based etc as mineral spirits and paint thinners are required. Thank You so much for your answer!! Keep up the good work Love your Posts!! I love your work! What brand/model of spray gun do you use? I’ve been using chalk paint and a brush but really want to try spraying with milk paint soon. Thanks! Thanks so much Zoe! I use the Husky HVLP Spray Gun… and love it! Beautiful!!!! I love your work. Thanks so much for sharing it. I just purchased this milk paint. Did you put any type of top coat over the paint? Also, do you think milk paint would hold up well on kitchen cabinets? Thanks!